d-Amino acids are stereoisomers of l-amino acids. They are often called unnatural amino acids, but several d-amino acids have been found in mammalian brains. Among them, d-serine is abundant in the forebrain and functions as a co-agonist of NMDA receptors to enhance neurotransmission. d-Amino-acid oxidase (DAO), which degrades neutral and basic d-amino acids, is mainly present in the hindbrain. DAO catabolizes d-serine and, therefore, modulates neurotransmission. 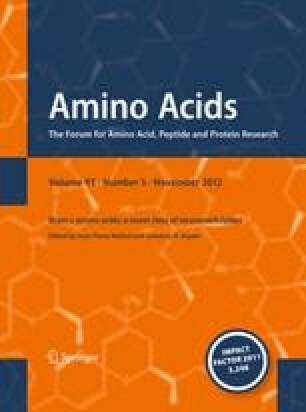 In the brains of mutant mice and rats lacking DAO activity, the amounts of d-serine and other d-amino acids are markedly increased. Mutant mice manifested behavioral changes characteristic of altered NMDA receptor activity, likely due to increased levels of d-serine. d-Serine and DAO have been demonstrated to play important roles in cerebellar development and synaptic plasticity. They have also implicated in amyotrophic lateral sclerosis and pain response. There have also been several lines of evidence correlating DAO with schizophrenia. Taken together, the experiments indicate that d-amino acids and DAO have pivotal functions in the central nervous system.